Thanks for your company today. Enjoy the rest of your weekend. 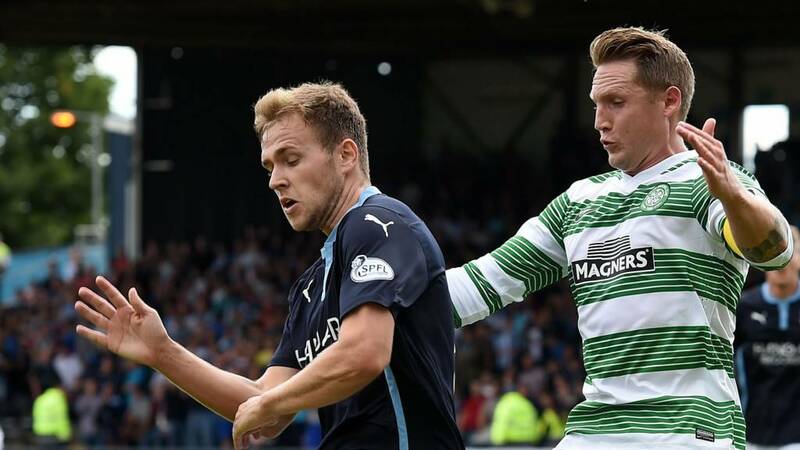 There will also be highlights of yesterday's Scottish Premiership matches on the BBC Sport website from 18:00 BST. You can watch those highlights on Sportscene on BBC One Scotland at 22:25 BST. Time for me to go, there'll be more reaction to today's match later on the BBC Sport website. Celtic and Dundee are on seven points as league football takes a break to accommodate international fixtures. "We had a good start. We were unfortunate not to come away with all three points." Zax Crossley in Grangemouth: "What Celtic are playing at I don't know. They should have never brought Berget in. Mackay-Steven would have been a much better fit with our squad and he's Scottish would have picked up the vibe straight away." Dundee extend their unbeaten run as Celtic go a fourth match without a win. A much better performance from the Scottish champions earned them a point but Dundee were impressive throughout a highly entertaining match. Greig Kelbie: "Celtic have looked rank rotten the entire match. @BBCSportsound #bbcsportscot." Two minutes of stoppage time being played. Yet another chance for Dundee up their right-hand side and this time Luka Tankulic drags his shot across the face of goal. Andy MacCormick: "I think Deila is a great manager. He just needs time. Given time, he'll be up there with McNeil, O'Neil and Stein." Chris Cornwall: "People are saying Celtic are going backwards. I'm old enough to remember the Brady and Macari era. 20 years and counting players not good enough to play for the club. It's like history is repeating itself. I hope I'm wrong H H."
Kyle Letheren beats Leigh Griffiths' powerful shot out for a Celtic corner. But now Celtic threaten and Anthony Stokes plays a one-two with Leigh Griffiths before firing against the outside of the post. After sustaining a period of Celtic pressure, Dundee have been much more in the game in the last 10 minutes and will feel they should be ahead again. A 25-yard strike from Dundee substitute Luka Tankulic flashes across the face of goal. And another chance for Martin Boyle. The winger jumps over Jason Denayer's challenge and drags a shot inches wide of the Celtic goal. Martin Boyle speeds away and fires in an angled shot from the right, forcing a fine save from Celtic goalkeeper Craig Gordon. Into the last 15 minutes. Is there to be a winner? Dundee get in on their right-hand side and Martin Boyle has a shot deflected wide by Jason Denayer. However, the officials award Celtic a goal kick, much to the hosts' frustration. Gary Irvine makes a vital clearance deep inside the Dundee box after Kris Commons drills in a low cross. Last substitution of the match. Nir Biton replaces Beram Kayal for Celtic. "Celtic have certainly upped the pace, much, much better in the second half. Dundee are struggling." Kris Commons' corner is met by Eoghan O'Connell's glancing header but the Celtic defender's effort drifts wide. Leigh Griffiths' first goal of the season brought Celtic level. Martin Boyle replaces Philip Roberts for Dundee. Kris Commons tries to loop a volley into the net but it's an easy catch for Dundee goalkeeper Kyle Letheren. Chris Cassidy from Wakefield: "Berget is not good enough, Peter Lawell needs to admit he got it wrong Deila has had a shocker since day 1, badly beaten in Europe and now struggling in the league, this is near enough the same team that won the league last season, Deila is not the right man for this job." Dundee captain Gary Irvine is cautioned for taking out Leigh Griffiths. Around half-an-hour left at Dens Park. Dundee make a double substitution. Simon Ferry and Luka Tankulic come on in place of Peter MacDonald and Gary Harkins. Emilio Izaguirre's shot is blocked in a crowded Dundee box. Much more forceful play from Celtic. John in Dundee: "dundee looking like the dark blues of old, fearless and attacking!! Great game"
John in Manchester: "Lawell will never admit he got ht wrong. People in his position see admission as a sign of weakness & fear the backlash if seen to be negative. Another worrying day at the office." Celtic have made a change at the break with defender Eoghan O'Connell on for Adam Matthews. Matthews has a calf injury. Celtic begin the second half. Second half coming up. Can Dundee claim a third straight victory or will Celtic end their run of three matches without a win? James McPake's first-minute goal still separates the sides and Dundee deserve their lead after some forceful attacking place in the opening period. Celtic almost levelled on the stroke of half-time but they have struggled and manager Ronny Deila has already brought Leigh Griffiths on from the bench to change things up. Kyle Letheren keeps Dundee ahead at the break as he tips over Anthony Stokes' swirling free-kick, which appeared to miss everyone as it bounced up from near the six-yard box. Toniwater: "#bbcsportscot this is very poor from The Tic, serious questions need to be answered sooner rather than later! Worst Celtic side in years"
bringthemonjpn: "#bbcsportscot Dundee just need to keep pushing forward and the three points look good"
MBEHAN: "With VVD & Mulgrew there is no leadership in this Celtic side, Ambrose and Berget not good enough for SPFL never mind Europe #bbcsportscot"
As well as texting, you can get in touch via Twitter. The hashtag to use is #bbcsportcot. has been linked with a return to Hibernian. However, Ronny Deila says he too is remaining in Glasgow, as well as Anthony Stokes. Leigh Griffiths comes on in place of Jo Inge Berget. No sign of an injury for the Norwegian, it appears Celtic manager Ronny Deila is wanting more from his attackers. Kris Commons returned to the Celtic line-up as captain but has endured a frustrating match so far. Beram Kayal is off balance as he curls a shot high and wide of the Dundee goal. Chuck from Ayr: "Celtic dont have a defense, no midfield and no decent strikers. Who's LAWELL kidding saying that Delias the man & will get it RIGHT!?" "Celtic are so, so vulnerable at the back and they're not great at decision-making, which is a bad combination." A long ball from Philip Roberts is chased by Peter MacDonald, who gets there just before goalkeeper Craig Gordon only to lift a shot wide. Let me know your thoughts via text on 80295. Not such an impressive effort on this occasion from Philip Roberts as his low shot trundles into the hands of Craig Gordon but the Dundee winger is eager to cut in from the right at every opportunity. Celtic's Emilio Izaguirre is booked for a late challenge on Philip Roberts. Manager Paul Hartley issues instructions from the technical area as Dundee seek to build on their early lead. Philip Roberts is causing Celtic all sorts of problems on Dundee's right-hand side. Emilio Izaguirre is struggling to contain the winger. Peter MacDonald is in the mood today. The experienced forward beats two Celtic defenders as he cuts in from the left and only a Jason Denayer block prevents the eventual shot troubling Craig Gordon. Good move from Dundee as Peter MacDonald and Philip Roberts exchange passes but the latter's cross is just too far in front of the striker. Celtic are almost in with Kris Commons in behind Dundee's defence but he loses his footing, allowing goalkeeper Kyle Letheren to smother the ball. This was the moment Dundee went ahead with McPake jumping highest to make the crucial connection. It's certainly been an exciting start to the match and there's been very little let-up from either side with Celtic particularly showing more urgency since the James McPake goal. Anthony Stokes shows strength as he holds off James McPake and gets away a shot but Dundee goalkleeper Kyle Letheren gets down to make the save. Now Celtic threaten with Kris Commons bursting into the inside left channel and looping a right-foot shot wide of the far post. It almost gets better for Dundee as Peter MacDonald runs on to Gary Harkins' headed knock-down and sees his dipping half-volley deflected wide. "An absolute stunner of a start from Dundee>"
The home side win an early corner and Phili Roberts' delivery is headed towards goal by James McPake, with Callum McGregor unable to stop the ball finding the net. Both sets of players make their way onto the pitch at Dens Park. Click here for more from Ronny Deila on Virgil van Dijk's future at Celtic. "We've given the players confidence. We've just got to keep it going. "If you get the ball, you have to use it well. Every team can beat each other so we're looking forward to the game today. "Hopefully the players can put on a good performance." "He's going to stay here and that's the most important thing. He is very important for us. "He's not here today because there's been a lot of speculation and he has been thinking a lot. He also has a pregnant girlfriend at home. He was not 100% focussed. "I'm really looking forward to the game. It's very important. Dundee are an offensive team and they've been good so far." Dundee are still unbeaten in all competitions so far this season and followed their first Scottish Premiership win of campaign last week with a midweek League Cup victory over Raith Rovers. Jason Denayer and Kris Commons return to the Celtic starting line-up. New signing Wakaso Mubarak is on the bench. Kyle Letheren, fresh from being called up to the Wales squad, is back in the Dundee team and Gary Harkins also makes a return. Dundee: Letheren, McGinn, Konrad, McPake, Irvine, Roberts, McGowan, Harkins, McAlister, MacDonald, Stewart. Subs: Davidson, McBride, Ferry, Bain, Tankulic, Boyle, Wighton. Celtic: Gordon, Matthews, Ambrose, Denayer, Izaguirre, McGregor, Johansen, Kayal, Berget, Commons, Stokes. Subs: Wakaso, Biton, Pukki, Zaluska, Griffiths, O'Connell, Henderson. However, Celtic manager Ronny Deila has told BBC Scotland Van Dijk "is going to stay" with the club. Virgil van Dijk has been left out of the Celtic squad amid speculation about his future. The 23-year-old Dutch defender has been heavily linked with a move away from Celtic Park. Read today's Scottish gossip column. Good afternoon and welcome to today's live coverage of Dundee v Celtic.